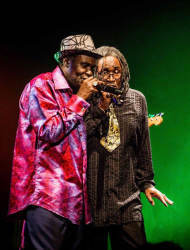 Fusing the harmonies of Motown with the roots and dancehall sounds of reggae, The Wailing Souls have ridden the crest of Jamaica's music for more than four decades. Nominated for Grammy awards three times, the group scored hits with classic roots reggae tunes, War and Bredda Gravlicious, Firehouse Rock, and 1992 album and title track, All Over The World. Additionally, the group scored number one hits with Things and Time, Jah Jah, Old Broom, and Shark Attack. The Wailing Souls' recording career has been nothing short of historic. Vocally trained by Bob Marley and the Wailers' teacher, Joe Higgs, they worked with legendary reggae producers including Coxson Dodd of Studio One, Henry 'Junjo' Lawes,Channel One Studios, Delroy Wright, Lloyd 'King' Jammy’s, as well as recording several early tunes at Bob Marley's Tuff Gong Studio. The Wailing Souls attracted global attention when their music was featured in the 1993 Disney film, Cool Runnings. The soundtrack album was an international hit, selling nearly half a million copies worldwide. The Souls had three songs on this soundtrack including the hit, Picky Picky Head. Formed in Trench Town, Kingston, Jamaica, in the late-1960s, The Wailing Souls have experienced numerous transformations. Their discography (over 26 albums to date) includes singles recorded as The Renegades, Pipe & the Pipers, and Atarra. Sly & Robbie and the Roots Radics are only a few of the stellar musicians who have worked with The Wailing Souls. Still one of the most powerful forces in Reggae, The Wailing Souls continue to tour globally and record new songs with the vigor that they had singing in Kingston's Trench Town decades ago. In Early Spring 2017 The Wailing Souls will be releasing their long awaiting album.